Caroline Elementary School celebrated its 50th anniversary last Friday. 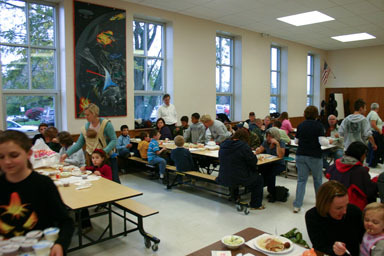 The school was full of parents and students celebrating the half-century mark. 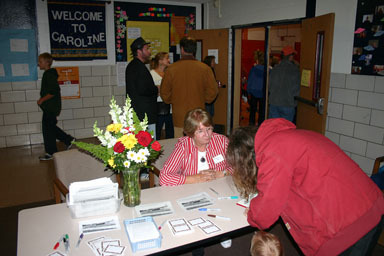 Signing in to the event. Town of Dryden students go all over the place for school - the Dryden schools are the largest chunk, followed by the Ithaca schools, with Groton, Cortland, and Lansing districts all having a piece. In the Dryden part of Ithaca district, most students go to Caroline Elementary School. Bethel Grove, Snyder Hill, and Ellis Hollow students have been going there for decades, and Varna students moved there in 2005. Our house is on the boundary on the Ithaca and Dryden districts, but on the Ithaca side, so Caroline is likely where Sungiva will go to school. Doing the locomotion in the gym. They had a DJ in the gym, and food in the cafeteria, with slides showing the world in 1959. 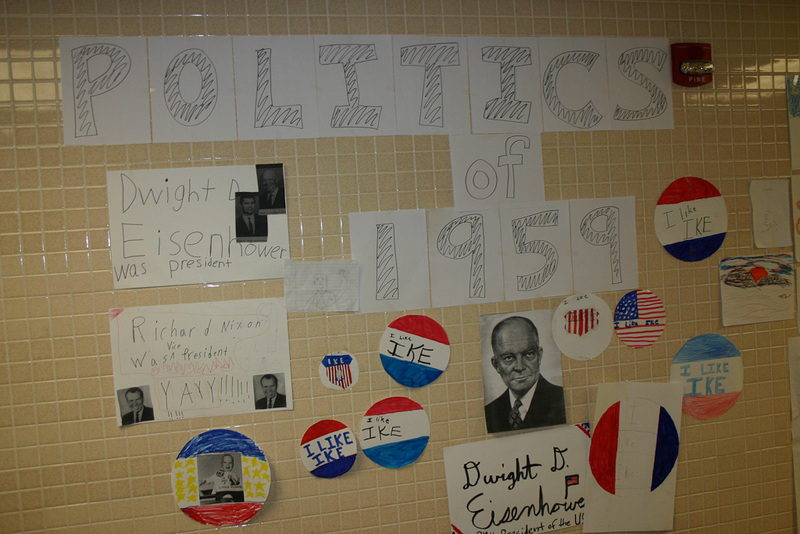 The school had all kinds of student creations on the walls, looking at different aspects of 1959. The history table in the cafeteria. Caroline schoolers' view on 1959 politics. For a lot more pictures, of the celebration and the school, I've posted a gallery of photos. 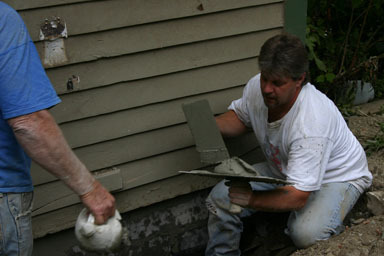 With the drainage fixed, it was now time to repair the damage that water had done to the foundation. My southern basement wall had scars across its upper face where concrete had turned to dust and fallen away, and my big question was just how much concrete would have to be replaced. 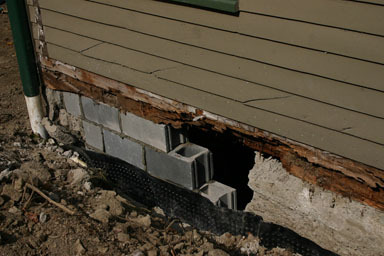 As it turned out, the damage was only about three cinder blocks high, but it was pretty severe. Albert and Nick did most of the masonry work. Albert started in before Nick arrived with the hammer drill, taking a mason's hammer to the western edge of the wall. He broke through in just a few minutes. Albert reaches daylight in just a few minutes with a mason's hammer. 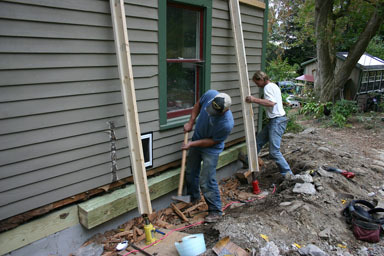 They worked in small sections, demolishing a section of concrete before laying new concrete block. 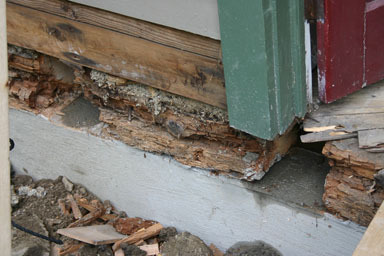 Some sections were more damaged than others, so the amount they had to remove varied a bit. When one section was complete, they demolished the next, building a continuous line of cinder blocks across the wall. The first section of new block. After they finished putting in the block, they put a coat of mortar all the way across it. From the outside, the result looks like the concrete part of the wall never had these problems. Looking at the wall now, it's hard to imagine the amount of dust and debris that went into making it, the hard work of hauling broken concrete out and bringing in new block. You can see some of that in the gallery, but somehow the pictures feel much lighter than the actual work. 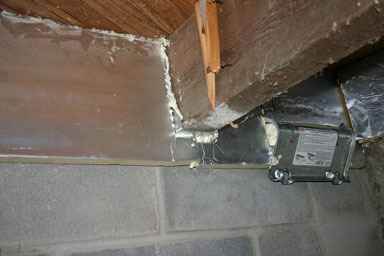 The concrete wall was finished, but the beam above it was still rotted, in urgent need of replacement. The town asked people to rank various potential problems, unleashed pets, dog waste, litter, and noise, on a scale of 1 to 5, with 1 being "no problem at all" and 5 being "major problem." The biggest problem was unleashed pets, with 19 percent of people ranking that 4 or 5, while 52 percent of responders said it was "no problem." There are also lots of comments on the article. Dryden Police accused Frank B. Sears, 66, for trafficking in several types of prescription drugs, including more than 500 oxycodone, morphine sulfate, opana, vicoprofen and diazepam tablets and pills of various sizes, according to court papers. Diazepam is used to treat anxiety disorders. The other drugs are painkillers. Sears lives at Willowbrook Manor, an apartment building for senior citizens in Dryden, and he stashed the drugs in his room and separate storage area there, the documents allege. It sounds like Dryden police built a rich case against him, so perhaps he'll be off to a very different kind of senior citizens home. In brighter news, Cathy Wakeman reports on the many good things local organizations are doing, including the Etna playground build Friday and Saturday, the Sertoma Spaghetti Dinner (followed by a silent auction) next Friday, Covenant Love School student art on display at the Dryden Community Center Cafe, the Dryden Youth Opportunity Fund's call for grant applications, and Dryden Rotary's lottery for a food run at Clark's. 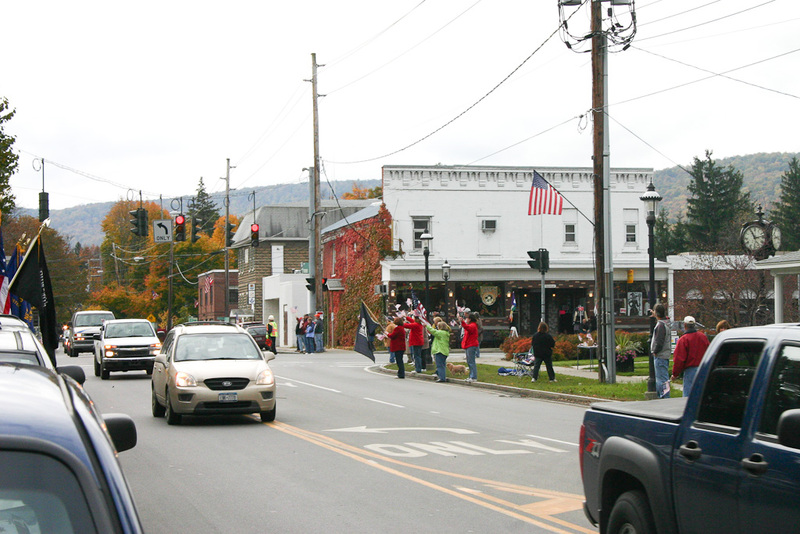 Hanshaw Road residents may be interested in the continuing battle over zoning next door in the northeast corner of the Town of Ithaca. There's been a lot of discussion around natural gas drilling in the area lately, and a lot of confusion around the basics of the leases that let it happen. Whether you're hoping to lease your land, wondering if it's a good or bad idea, or hope never to see your land drilled, figuring out those basic issues will help you figure out how all of this works. Leasing is a separate set of questions from the many regulatory issues, though it's still more complicated than just deciding if you want to sign a lease or not. Fortunately, Cooperative Extension and a few other participants will be having an event October 29th to look at this aspect of the gas story. It's mostly a separate set of questions from the state's environmental impact statement and local efforts to regulate this industry, but it's critically important to understand if your own property is in the neighborhood of gas leases, especially if you're hearing from gas company landsmen directly. 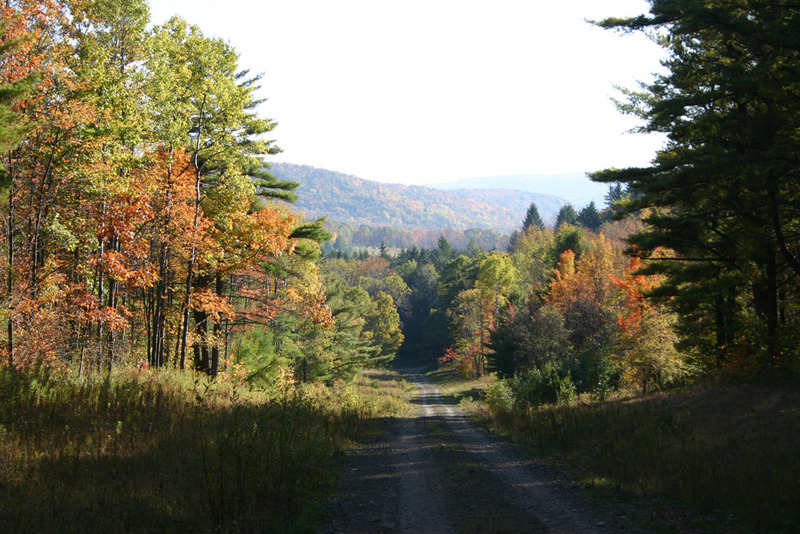 With increased natural gas development in the Southern Tier will come new and complex legal issues that affect both landowners and communities. Please join us on Thursday, October 29, from 7:00 to 9:30 pm to hear presentations by legal experts, followed by an opportunity to ask questions. The forum will be held at Cornell Vet School's James Law Auditorium on Tower Road, just a block from Rt.. 366. All are encouraged to attend this unique event sponsored by the Cornell Cooperative Extension (CCE) South Central NY Agricultural Team, together with Shaleshock Citizens Action Coalition, Community Science Institute, Finger Lakes Bioneers, Interfaith Action for Healing Earth, NYS Assemblywoman Barbara Lifton, Sustainable Tompkins, and Tompkins County Farm Bureau. For more information, please contact Schuyler CCE at 607-535-7161, or Tompkins CCE at 272-2292, or by email at: cab377@cornell.edu. More details will soon be posted to the CCE Natural Gas Development Resource Center website: http://gasleasing.cce.cornell.edu/ . Yesterday's Ithaca Journal had more of the kind of news I like to hear about Dryden. First, the Town is accepting a 12-acre land donation at the corner of Pinckney and Lower Creek Roads. 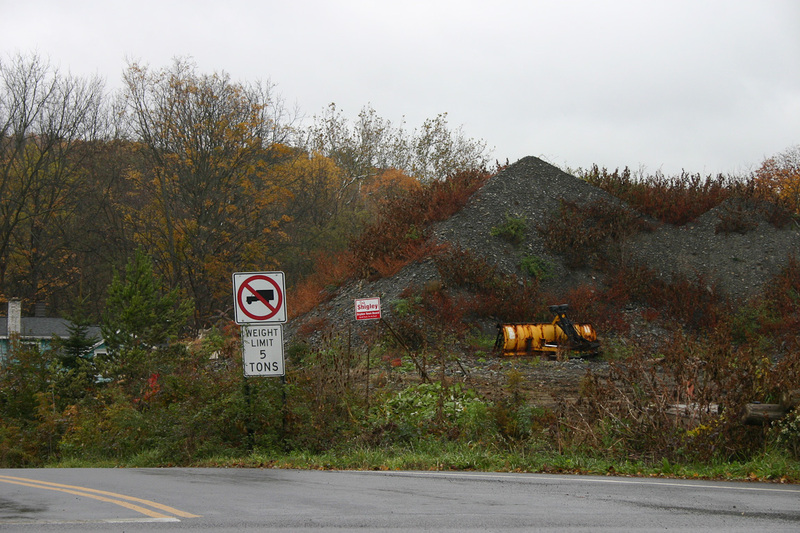 It's not great land for building, but it's a key buffer zone for Fall Creek. The next piece of news should help Dryden small businesses get started, as the Town is working with Alternatives Federal Credit Union to provide 2:1 matching funds on savings for small businesses. The money originally came from the federal government, loaned to Cayuga Press for a printing press purchase. Cayuga Press has left for Cortland, but the loan payments continue to Dryden. The town gets to keep the money, but can only use it for a limited number of projects, notably home repair and economic development. David Makar got this going, and he and Jason Leifer have seen it through. Private contributions can help Dryden too, of course! The Journal notes today that the Dryden Youth Opportunity Fund is taking applications for grants until October 31st. This charitable organization has spent $35,000 since 2003 "in support of school-, town-, and community- based programming benefiting Dryden youth." Have an idea? Apply. Want to help? Donate! Organizers said that "bikes, cars, trucks, military vehicles and helicopters are welcome," and asked participants to register between 8 and 9:45 a.m. on ride day at Marvin Park. 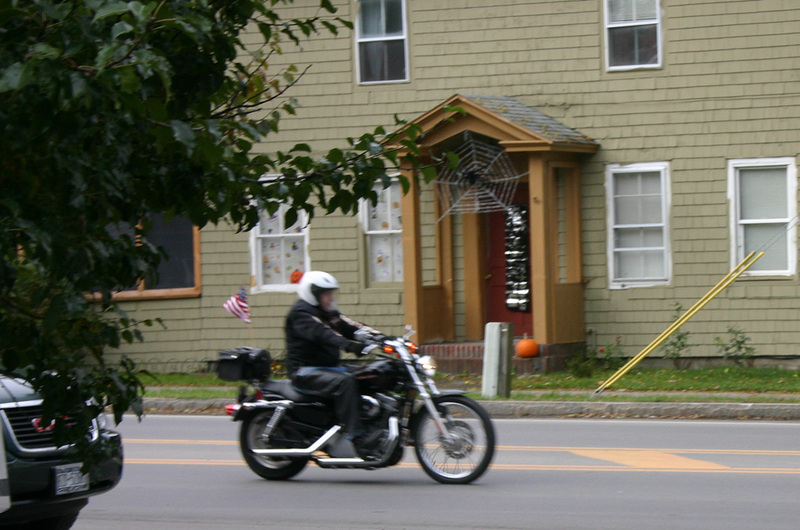 While the state can only erect signs at the ends of the route, communities are allowed to erect signs on private property if they wish, said Owego Veteran's Memorial Committee member Jim Raftis. I'm a little surprised that the state can only mark the ends, but hopefully Dryden can mark our portion. Signs in Owego and Sterling are kind of a long ways apart. 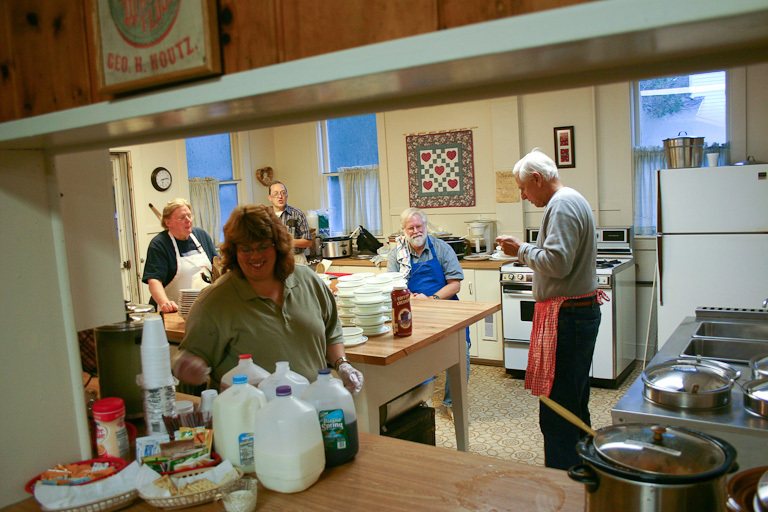 One of my favorite things about Dryden is that people will come out to get things done together. They'll work on our state forest trails (and again) or put together elementary school playgrounds. 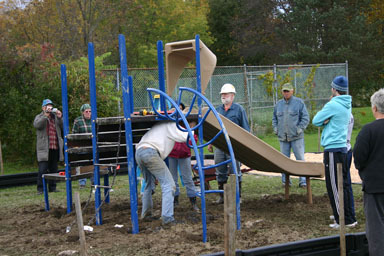 This weekend it was Etna's turn, as the Etna Community Association called on volunteers to assemble a new playground for kids ages 2-5 at the Etna Community Park. When I first got there, the main visible features were 12-inch holes in the ground, bored the previous day. The rain made things pretty amazingly muddy around the area where the equipment was to be installed. Volunteers were laying out a plastic border that we'd be filling with gravel and mulch, as well. 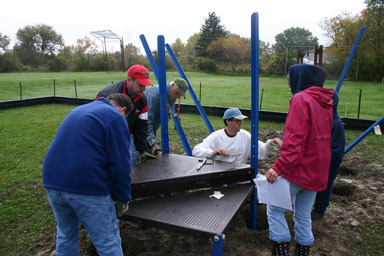 Getting the first few pieces assembled was a challenge - the decks were heavy, and keeping them stable meant multiple people holding them above the mud while we tried to set them just right for the bolts to work. As the structure came together and things became more stable, it got easier, but still took careful tweaking. 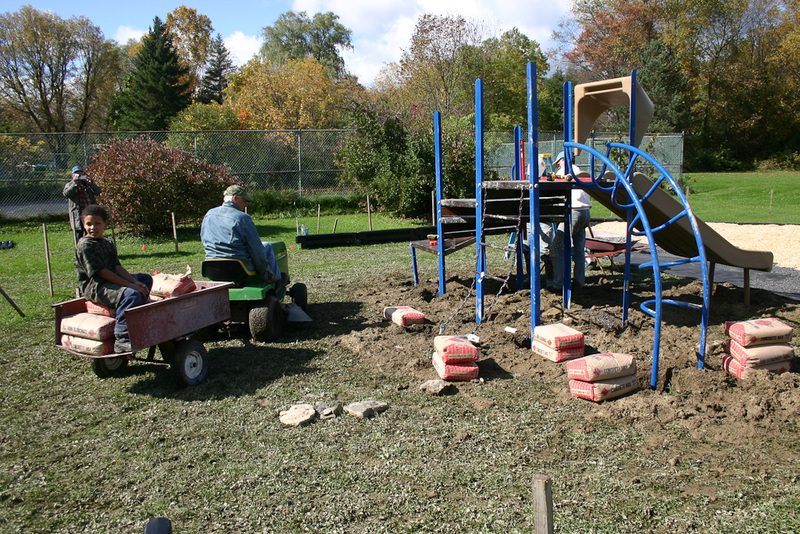 The mulch, gravel, and concrete were a ways away from the playground, but fortunately lawn tractors helped move the materials. 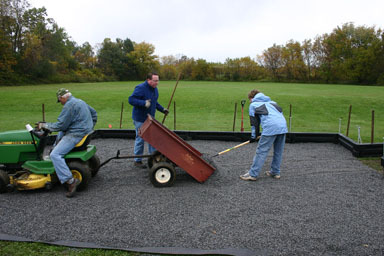 Town Board member Jason Leifer and County Legislator Martha Robertson unload a gravel delivery. I had to leave before they'd finished - which apparently was around 6:00pm from a 9:00am start - but I went back yesterday to see the finished structure. You can't actually play on it until Thursday, as the concrete needs to set, but it looks great! The structure, including the time of the company representative, Crystal, who did a great job of keeping things going during the build, cost around $10,000, of which Town of Dryden funds for community centers covered $8000. 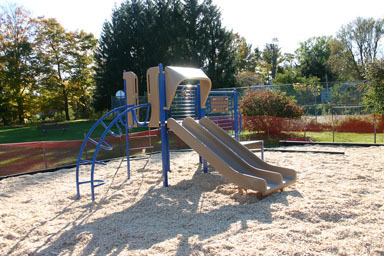 The mulch, gravel, concrete, and augur rental were extra, though. The result should last for years, keeping kids entertained for a long time to come. Those conversations, though, made this list of school spending by district per pupil more interesting. The data is from 2006-7, so isn't complete. The average district in New York State spends $15,981 per student per year, while the average district in the United States spends $9,666, and compensation. School spending in New York climbed 38.4% from 2001-2, while school spending in the United States as a whole climbed 24.5%. Enrollment statewide fell 3.2%, while it climbed for the country by 2.7%. Locally, the picture is similar. Dryden schools spent $14,711 per student, and spending climbed 39%. Enrollment fell 5.6%. The Ithaca schools spent $16,177 per student, and spending climbed 34.9%, with a 3.9% enrollment drop. Lansing's had the wildest rise, spending $16,392 per student, climbing 46.5%, with an enrollment drop of 5.1%. Groton spent $13,418 per student, climbing 41.5%, with an enrollment drop of 13.5%. Cortland spent $13,060 per student, with a spending climb of 29.1% and an enrollment drop of 2%. While I suspect that the gas drillers would ultimately prefer that no one regulate them, thereby avoiding all regulatory costs, the exemption the Bush administration gave them from the Clean Water Act doesn't end the conversation. 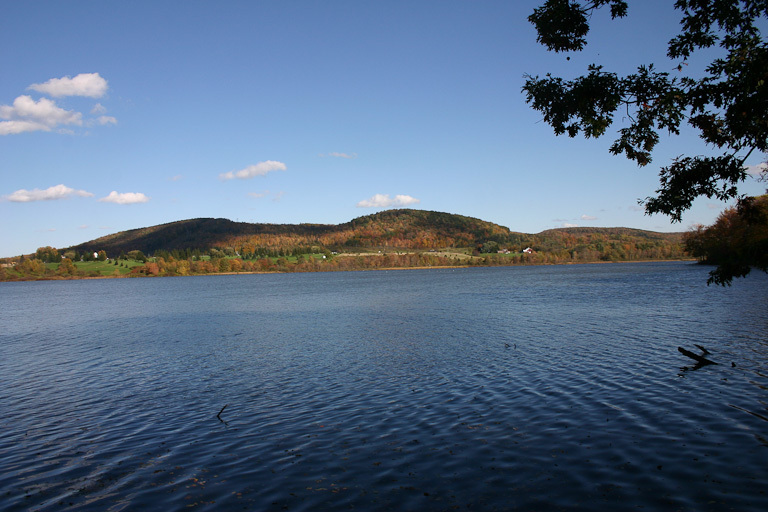 New York State is still figuring its regulatory approach out, publishing an Environmental Impact Statement as a first step. There are a lot of implementation details to sort out, but one that pretty much everyone will ask about is "who pays?". 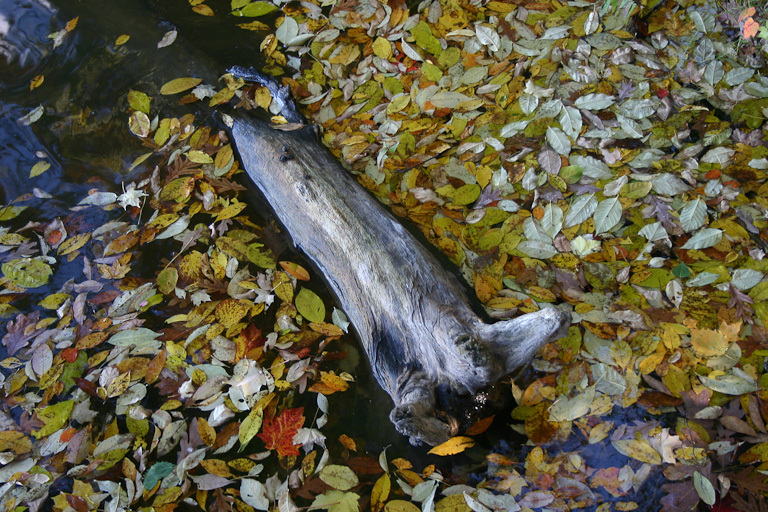 Risks to water, the report says, include turbidity, methane contamination and, to a lesser degree, potential for hazardous chemicals to breach well-bore casings or spill while being handled or disposed of on the surface. To deal with those threats, the state is calling on local health departments to oversee a testing program of private wells in drilling zones. Testing would begin before drilling starts, and continue for a year after it ends. I'm guessing that this proposal is an equal mix of local control - counties have health departments monitoring water already - and Albany's reluctance to actually spend money when it can just mandate counties to do it instead. Passing the responsibility buck and the taxation buck without actually providing cash is an unfortunately common approach in New York government finance, one that's only likely to get worse given the deteriorating condition of the state's finances. I kind of doubt they'll be willing to provide funds to towns to cover damage to roads, either. On the bright side, here's a good idea: printing out copies of the Supplemental Generic Environmental Impact Statement and leaving them in public places. Caroline seems to be ahead of Dryden, unless I just haven't seen the 809-page brick yet. If it's not available in Dryden, we definitely should make it available. 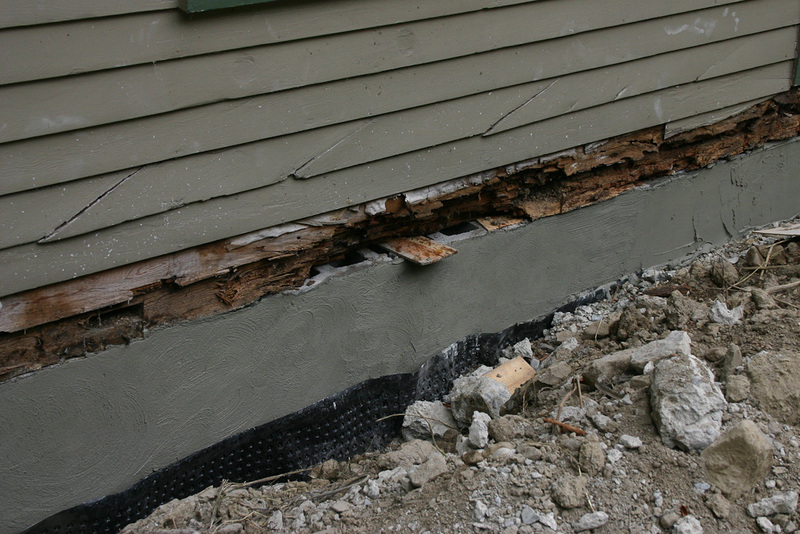 Once the crumbling concrete was repaired, it was time to move on to replacing the rotted sill beam. 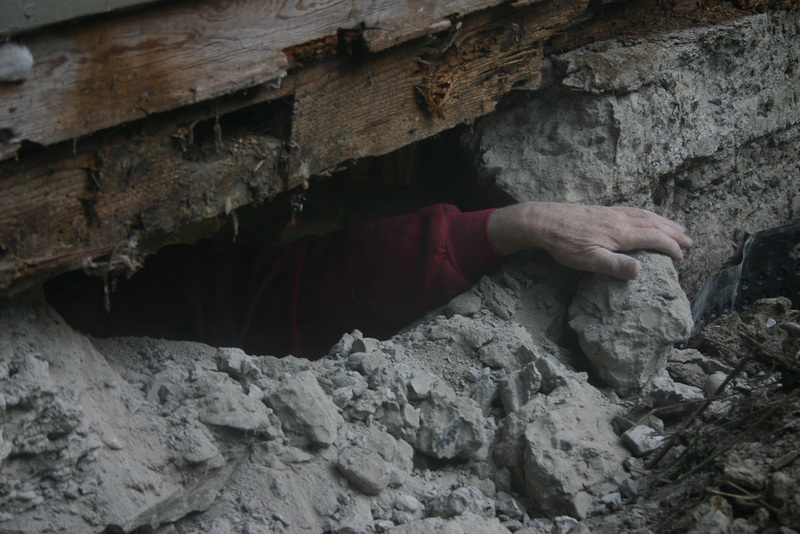 While the masons had been able to work in small sections, relying on what remained of the beam to hold things up, removing the beam itself meant that the floor joists and wall posts would be floating. That required adding support for both before actually tackling the beam. 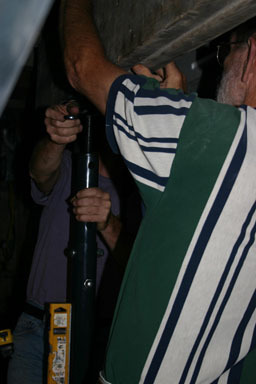 Dan and Cordell install a jack under the floors. Adding support for the walls. The beam itself was next, but as they chopped out pieces, they also reinforced the concrete block by pouring concrete down into it. Removing the beam, adding concrete. As the beam came out in sections, they added new 8x8 pressure-treated beams. The old pine beams - originally barn beams - had lasted 80 years in that moist environment, and hopefully these will last even longer. 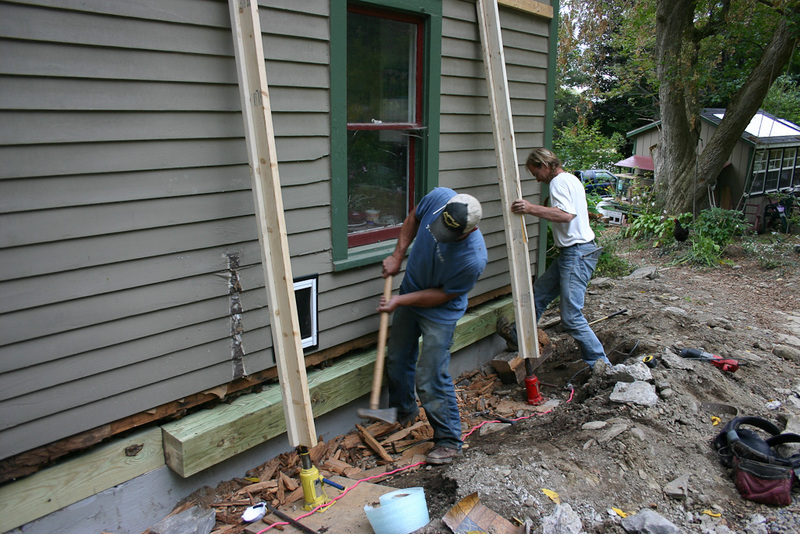 Hammering the new beams in was a challenge at times, but went faster as they moved along. Hammering in a new beam. 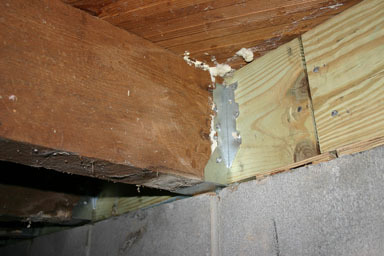 They attached the joists to the new beam with metal hangers instead of the diagonal nails that were originally there. The previous sill beam just rested on the foundation, without any attachment. 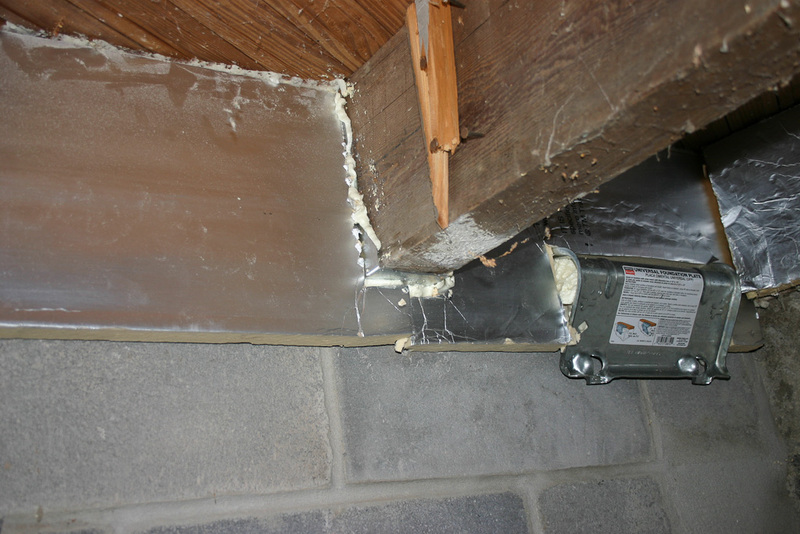 The new beam also got foundation plates to connect it. I'm not sure they're necessary, but they seem to be standard practice now. The other final touch they added to the beam was insulation, replacing the layer of isocyanate that our earlier energy efficiency work had put in with a slightly larger piece that sealed the gap between the beam and the foundation. Attaching the floor joists to the beam. 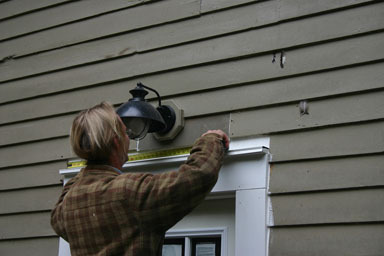 The pictures above are just a sketch of the work, really - I've posted a beam replacement gallery that shows more. The structure was now complete, but there was still trim work and a door replacement to come. On Sunday afternoon, we took Sungiva to see the fire trucks! At 18 months, I'm not sure she quite knows how exciting they are, but it's never too soon to get started. Spraying water from a fire hose. 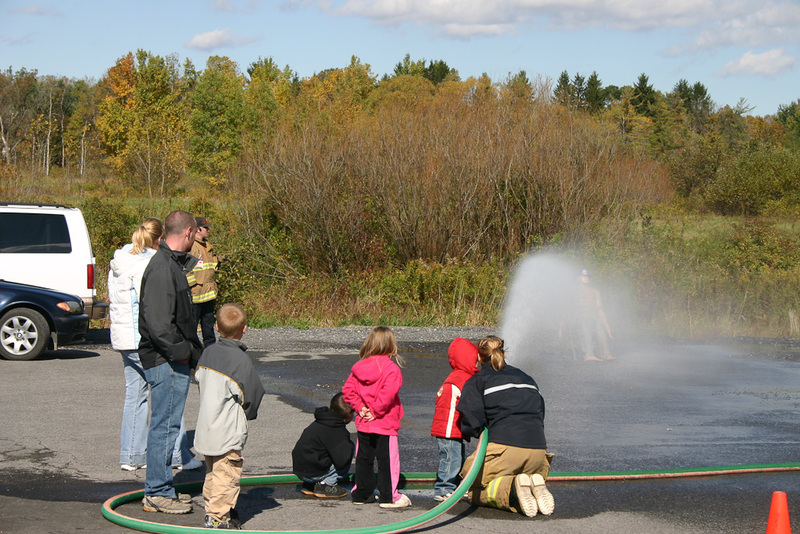 They had fire-fighting activities for kids, as well as information, equipment, and exhibits inside. 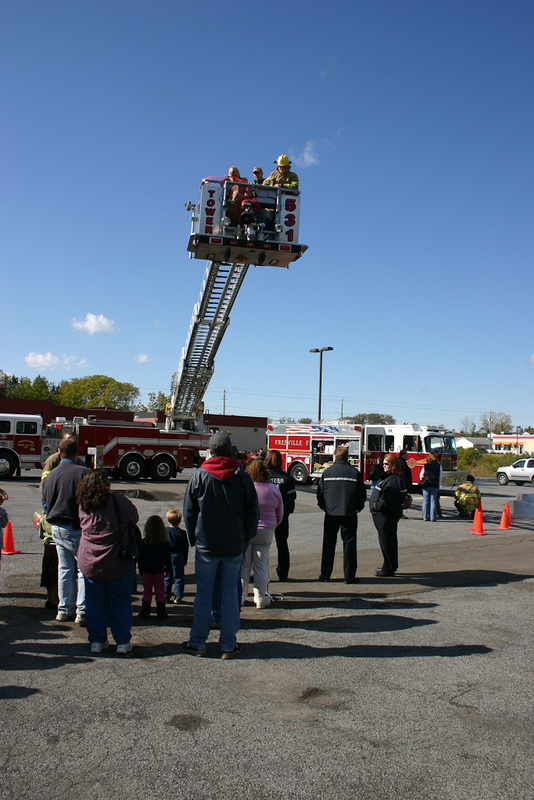 The Freeville Fire Department was also there, adding to the fun, and Dryden Ambulance had an ambulance set up to look inside. 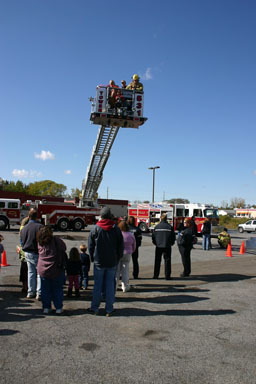 The rides on the ladder truck outside were especially popular. Going up in the ladder. It was a fun time on a beautiful day. 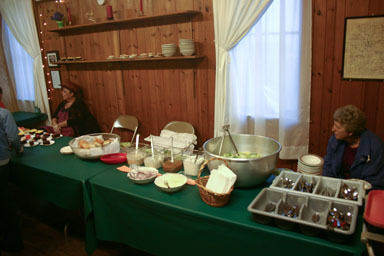 If you'd like to see a lot more, I've posted a gallery of the open house. 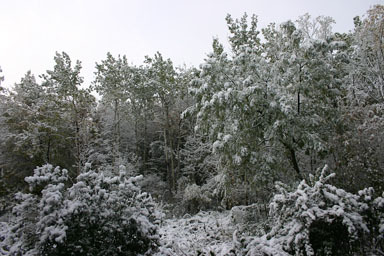 Frost came late this year, but now it looks like winter's coming early. 1-2 inches of snow forecast for October 15th and 16th? And I see snow on the radar already? Sometimes I talk about weather patterns. This year feels more like weather randomness. Be careful tonight and tomorrow! It'll be mixing with rain, which is never much fun. Well, sort of. It's strange to see snow when the leaves are mostly still on the trees. It doesn't seem to be enough snow to disrupt traffic, though there are some power outages. Events at the Etna Community Center have a habit of being delicious, even outside of the Chocolate Festival. 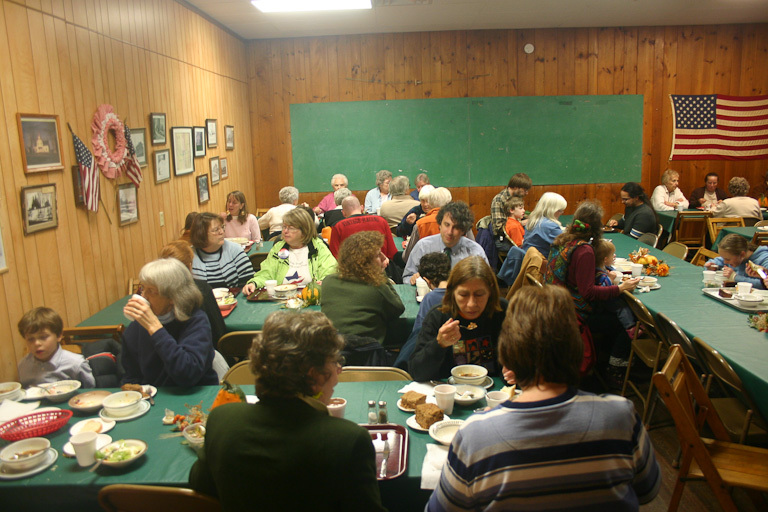 Wednesday night's Soup & Salad was both busy and delicious. The opening salad, bread, and dessert. 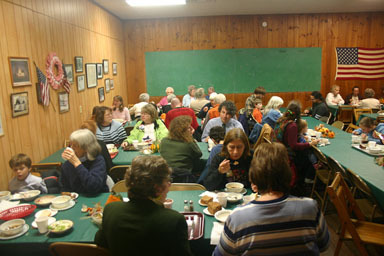 Crowd enjoying soup and salad. In the kitchen, the keepers of the soup.. It was a delicious meal, with probably a dozen soup choices at the beginning. They'll be having another one on Wednesday, November 18th. 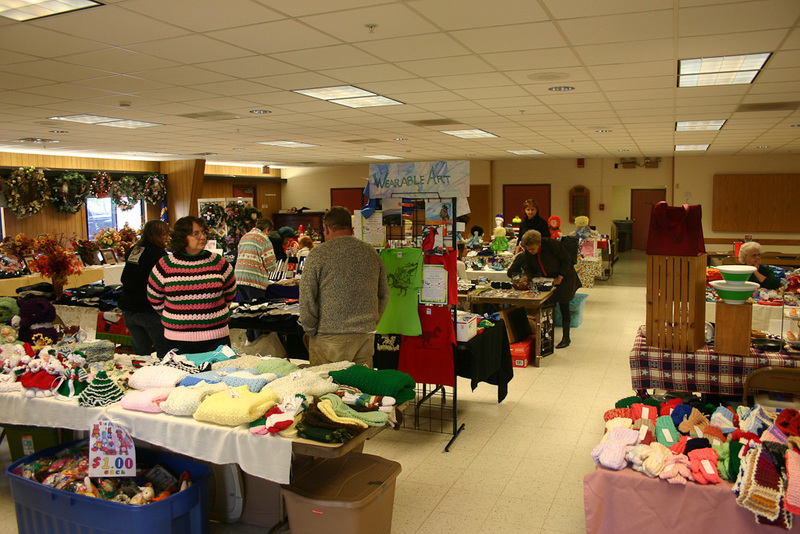 There will also be a craft festival, which will probably include something tasty, on Saturday, November 7th from 10:00am to 2:00pm. 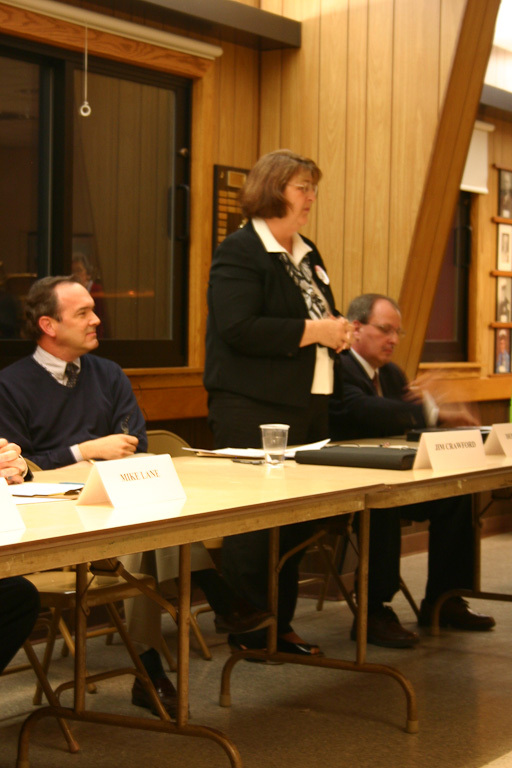 Almost a year ago, the Dryden Planning Board had a big overview meeting about upcoming zoning changes. It was fairly abstract, as they hadn't yet arrived at the details that make zoning conversations difficult. 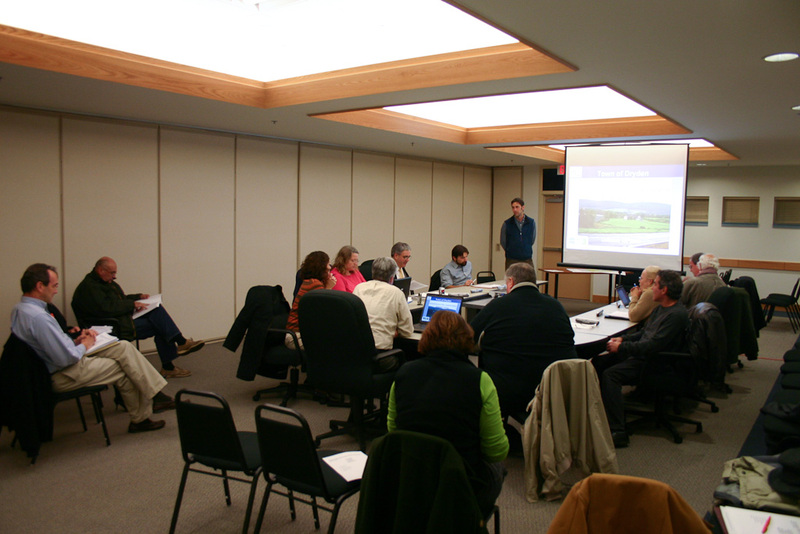 Last night, the Planning Board reconvened, in a joint meeting with the Town Board, and went over the proposed changes. Town Board and Planning Board at joint meeting. 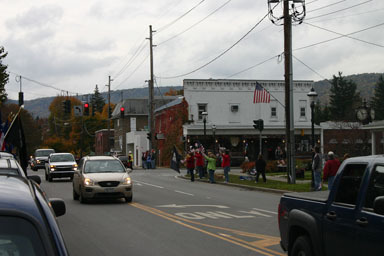 The Town hasn't revised zoning in a long time, but approved a Comprehensive Plan in 2005 and Design Guidelines in 2008. Instead of "R-D", I'll be in "Rural Residential" with a possible "Neighborhood Development Overlay District" that allows for some higher-density development. Hamlets will be in "Hamlet" zones, and there will be Rural Agricultural, Conservation, Commercial, and Light Industrial/Office zones. Instead of the simple but limiting calculations based on frontage and minimum lot sizes, the new zoning will allow for more flexibility based on how subdivisions are created. The math will definitely need some explanation, and they're including examples. 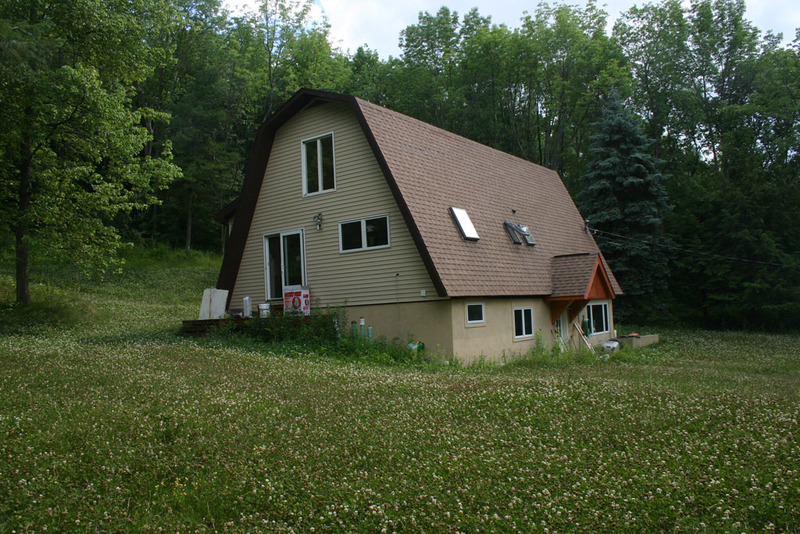 Current law encourages landowners who want to avoid complex conversations to subdivide slowly and in ways that scatter houses. The new law would give owners and the Planning Board an earlier conversation on how to break up lots, while still letting landowners subdivide slowly to avoid a bigger property tax hit. The areas zoned "conservation" will have a formula based on original lot size that limits development to 1 house per 2.5 to 8 acres of total land. Tables will reduce the amount of page-flipping needed to compare zones, and examples should ease the challenge of figuring out what it all means. As Joe Lalley, Chairman of the Planning Board put it, they're working to create an approach that "is streamlined... but accountable". It sounds like they'll be nailing down more details for a few months, but expect to see public meetings around the town in early 2010. Last Sunday, Angelika, Sungiva, and I wandered over to Dryden Lake, hiking the Jim Schug Trail. 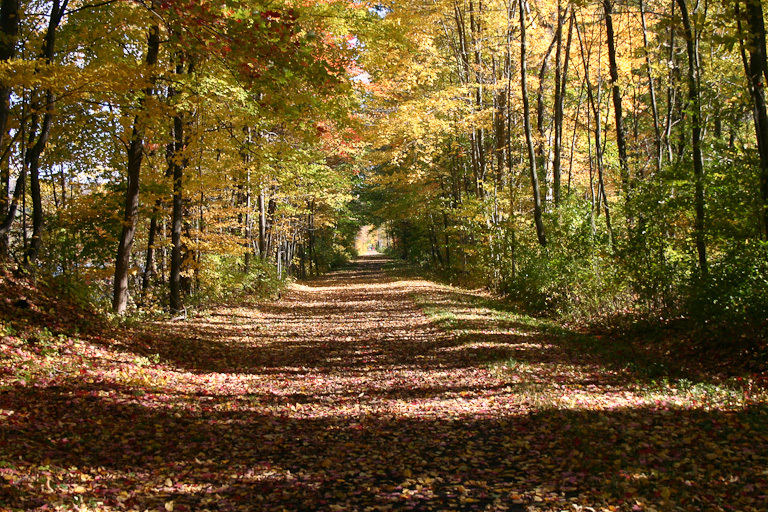 Upstate New York was near the peak of its autumn beauty, and it was a glorious day. View from the observation platform. 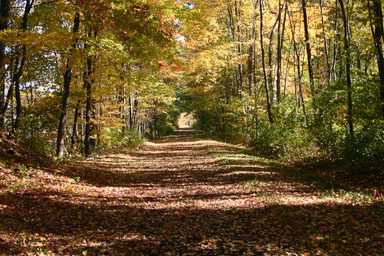 The Jim Schug Trail in autumn finery. I've posted a gallery of photos of the trail and the lake if you'd like to see more. Of course, we also have Dryden Lake in winter to look forward to. 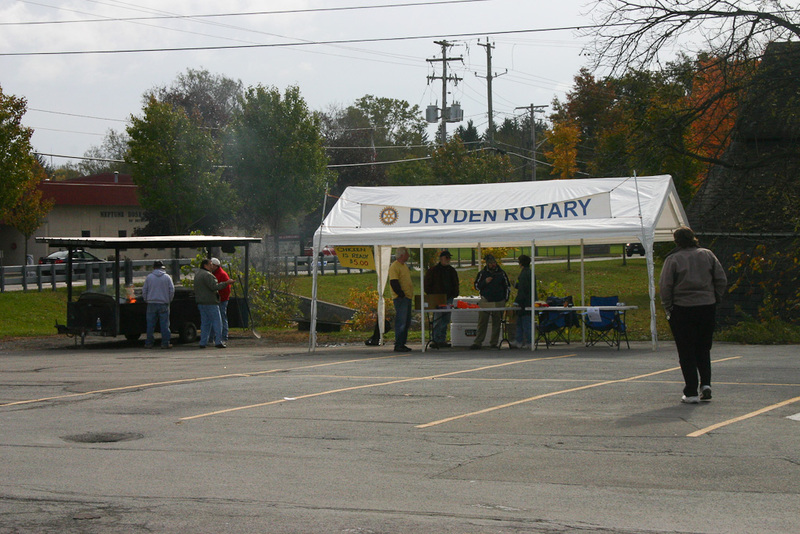 Dryden had a full set of events from Friday night into Saturday evening. 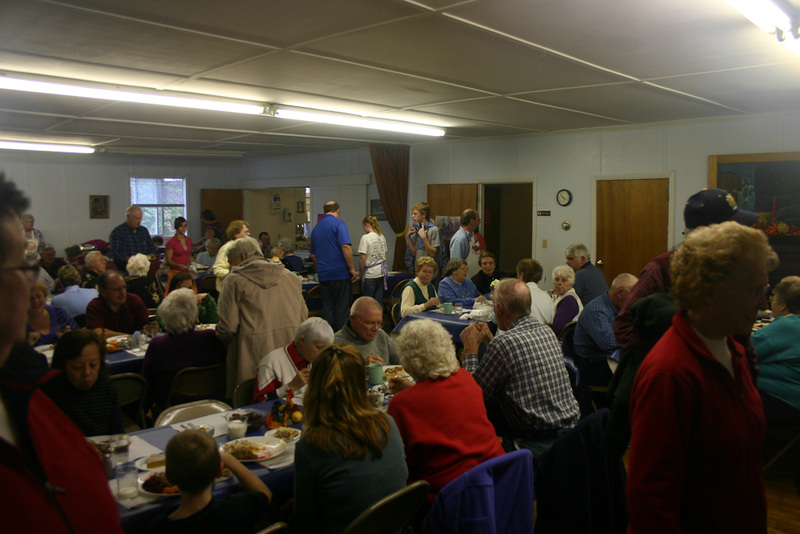 I started at the Sertoma Spaghetti Dinner and finished with a fine Turkey Dinner at the Freeville Methodist Church, but I think it's best to just tell this day in pictures. 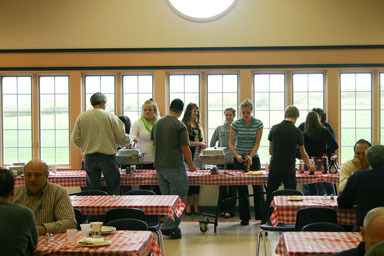 Happy crowd at Sertoma Spaghetti Dinner. 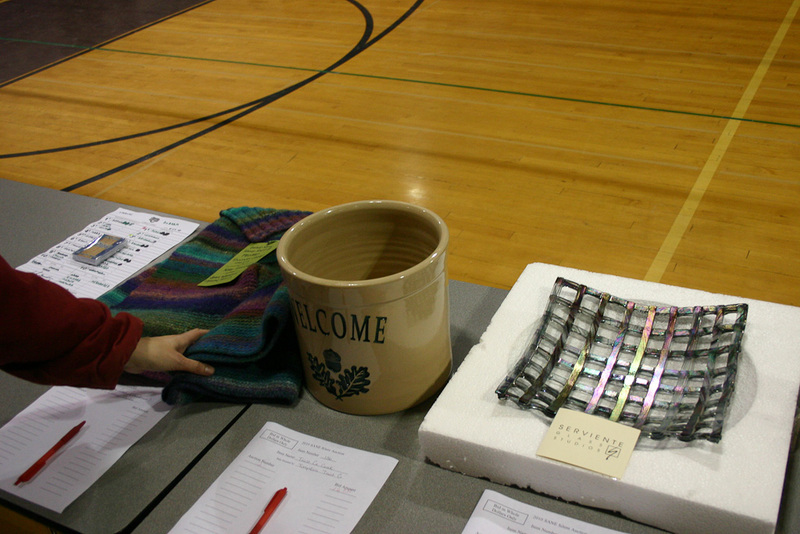 Silent auction for Dryden Senior All Night Extravaganza. Volunteers serve a pancake breakfast at Holy Cross Church. 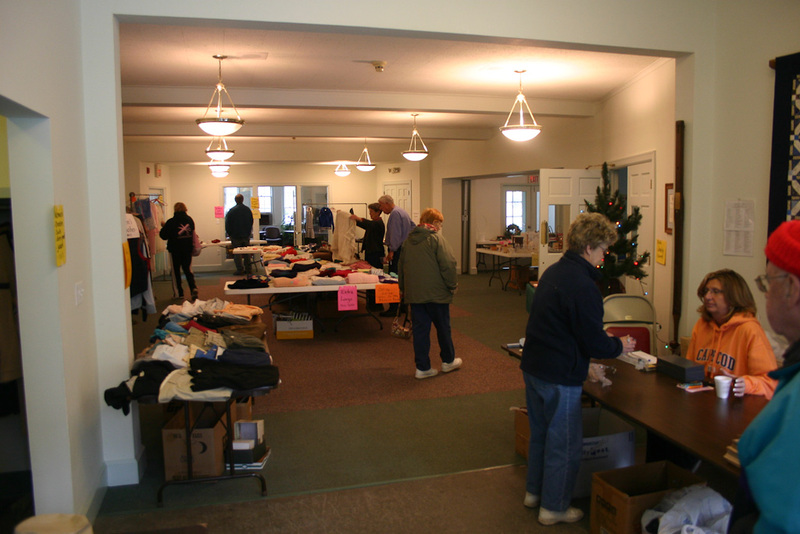 Dryden Seniors Bazaar at Neptune Hose Company. Dryden Presbyterian Church rummage sale. 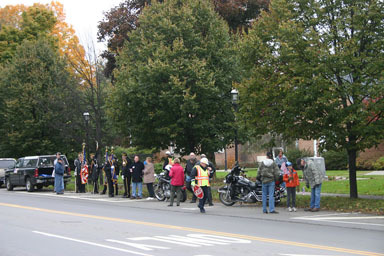 Honor Guard awaits the Vietnam Veterans Memorial Highway of Valor Tribute Ride. Motorcyclist in the Vietnam Veterans Memorial Highway of Valor Tribute Ride. 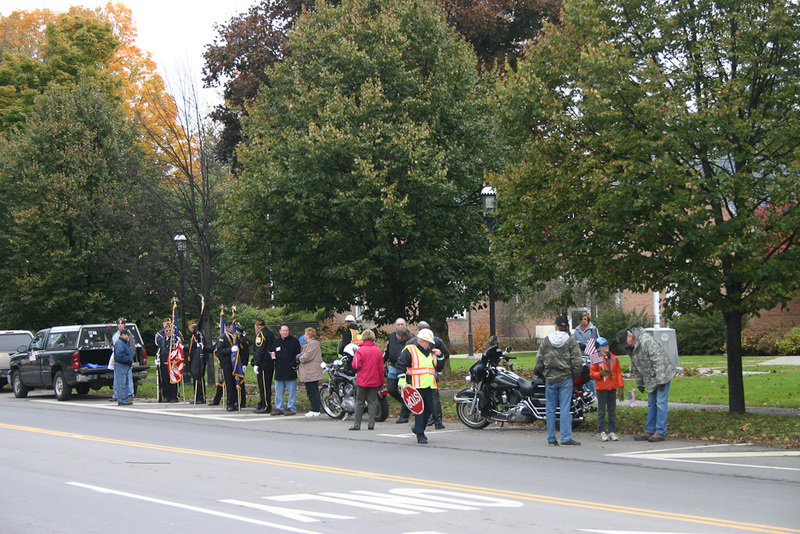 Welcoming the Vietnam Veterans Memorial Highway of Valor Tribute Ride. Dryden Rotary Chicken Barbecue at Clark's. Turkey dinner at Freeville United Methodist Church. 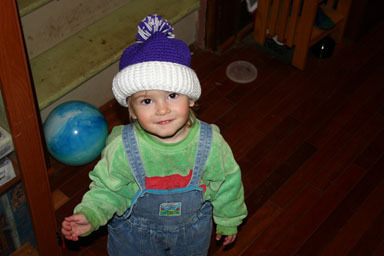 Home again, Sungiva wears a hat I got her at the Senior Bazaar. The Dryden Grange will be sponsoring a candidates forum at the Dryden Fire Station - 26 North Street, Dryden (map) - this Thursday night, October 22nd, starting at 7:30pm. The League of Women Voters will be moderating. 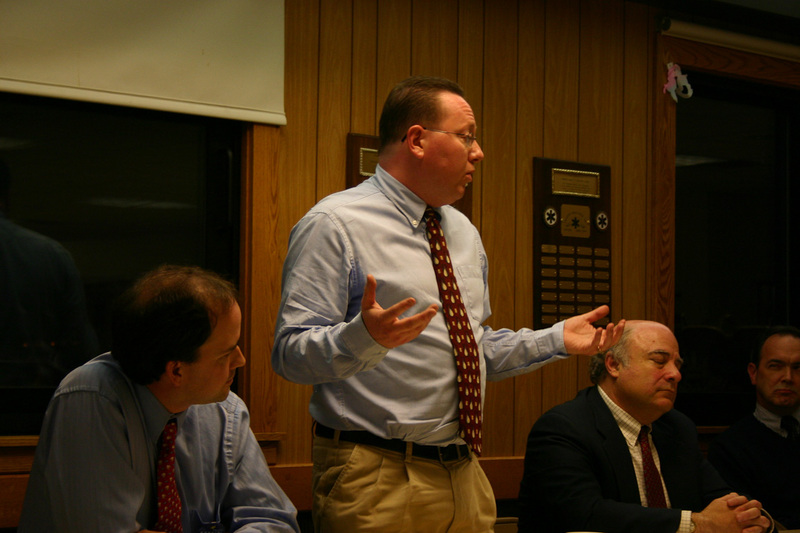 They'll introduce candidates in uncontested races, but the bulk of the session will be about the contested races - Mike Lane vs. Jim Crawford for the County Legislature seat on the east side of Dryden, and Jason Leifer, Simon St.Laurent (yes, that's me! 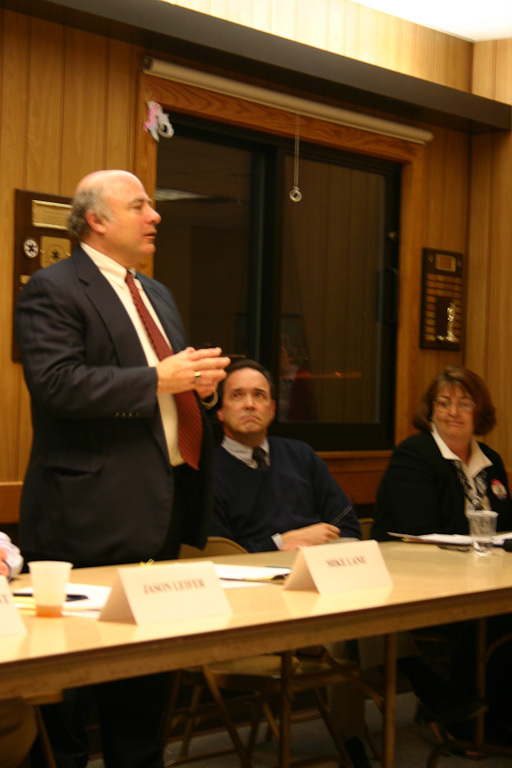 ), Steve Stelick, and Deb Shigley for two Town Board seats. 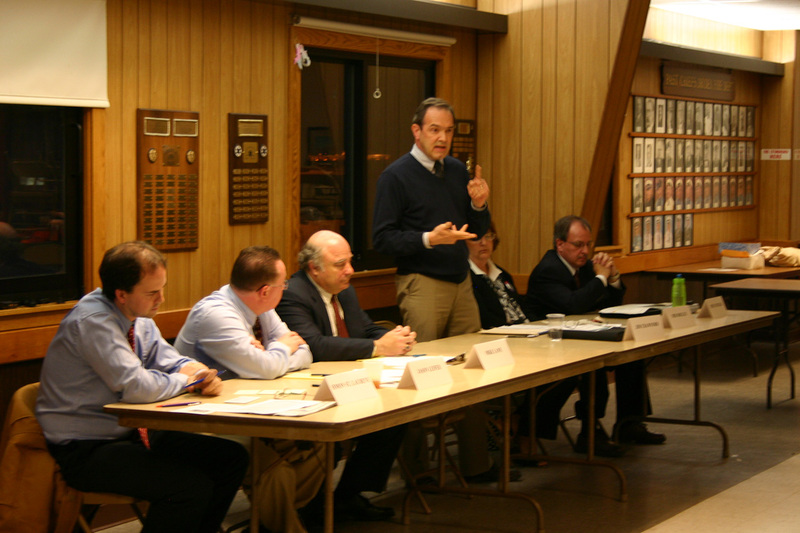 Each candidate will make a three minute opening statement, and then the audience may ask questions. Questions are limited to two minutes, addressed to a specific candidate or to all. 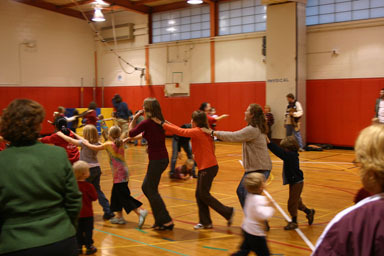 The answers are limited to two or three minutes depending on the number of participants. Should be an exciting night! I don't remember seeing much about criminal activity in the TC3 dormitories before, but the past week has had a burst. First, a recently-departed student overdosed on mushrooms and later stabbed a nurse in Cortland, and then three students were charged with breaking into nearby storage lockers. Hopefully TC3 is taking steps to make sure the crime spree is over. 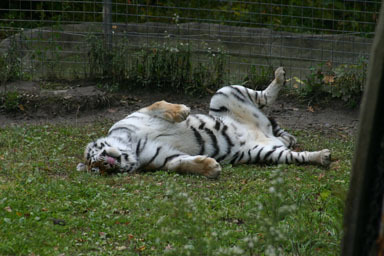 It would be great if Dryden (or even Tompkins County) had a zoo, but given our size and resources, that's not a campaign promise I'm willing to make. 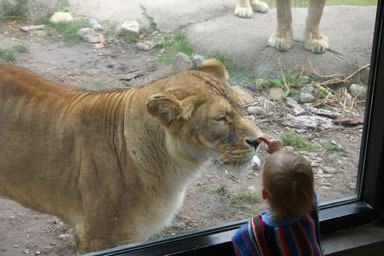 Instead, we've taken Sungiva a couple of times to the Rosamond Gifford Zoo up in Syracuse. We took her on her first birthday, when she was a little young to understand it all, and again last week. Sungiva watches the Humboldt Penguins. Sungiva pats a lion's nose (through a sheet of glass). There is much much more there, and I encourage folks to visit. I especially like that they've largely chosen animals that fit our climate for their outdoor exhibits, and all of them are fun to watch. 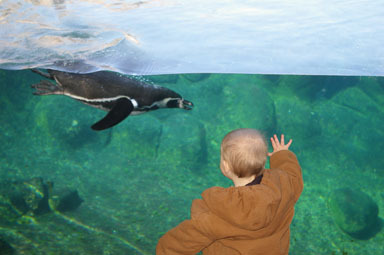 To provide a bit more idea of what's there, I've posted a gallery of zoo photos. 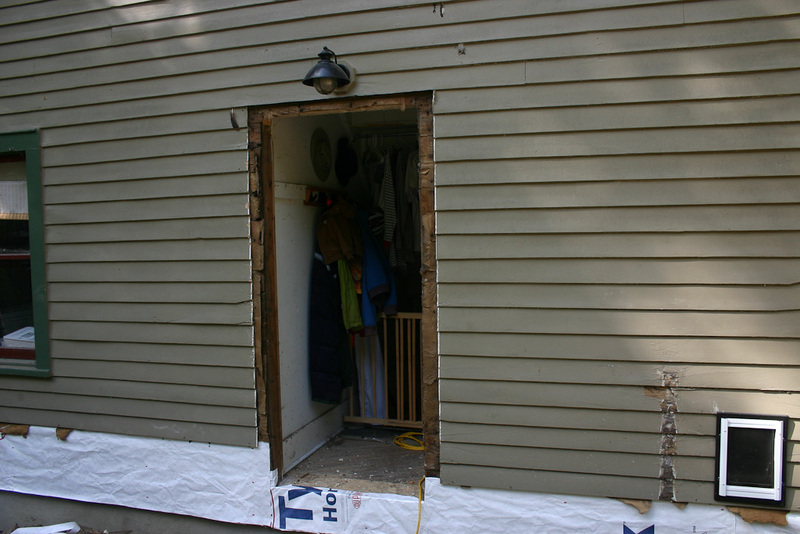 Once the sill beam was repaired, it was time to fix all the trim and to replace the door whose failing started the whole foundation repair conversation. 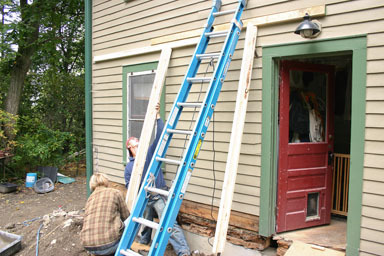 Once again, Sunny Brook Builders' carpenter Dan was in charge. The first step was removing the trim around the old door, and then removing the door itself and its frame. 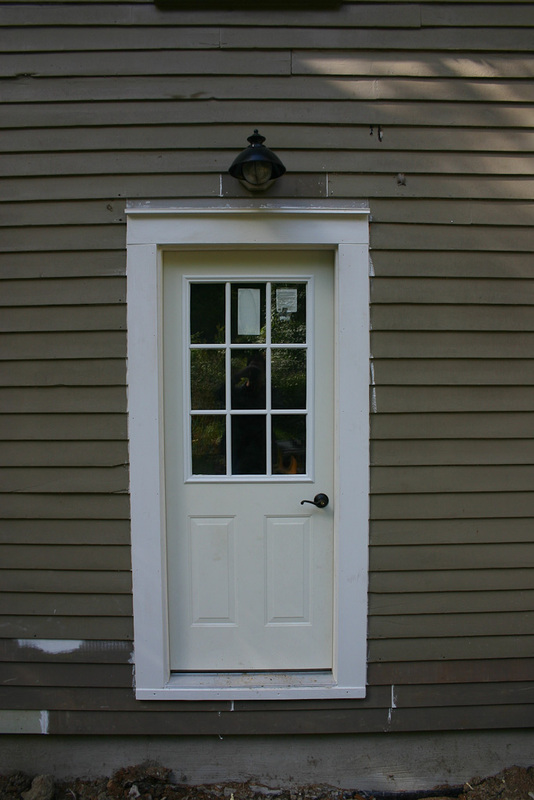 The new door - a steel door that's much sturdier though utterly lacking in the character of the old door - came as a pre-hung unit. Dan and Cordell installed it into the empty space. Installing the new steel door. 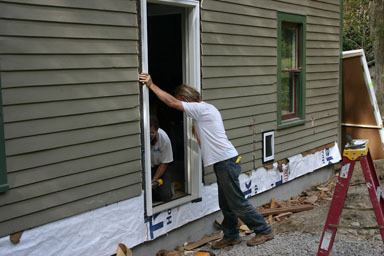 Once the door was in, it was time to work on the trim, including the flashing at the top which protects the trim from water. 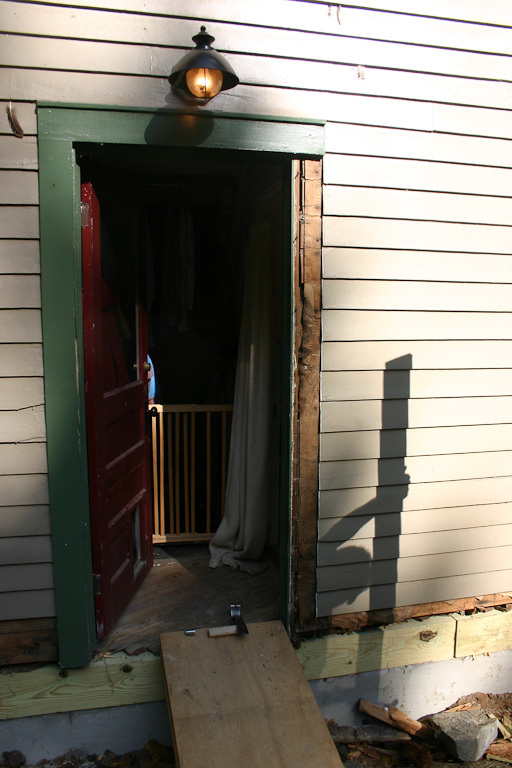 They also replaced and repaired all the trim that had been removed during the beam repair, leaving a primed surface it was my job to paint. 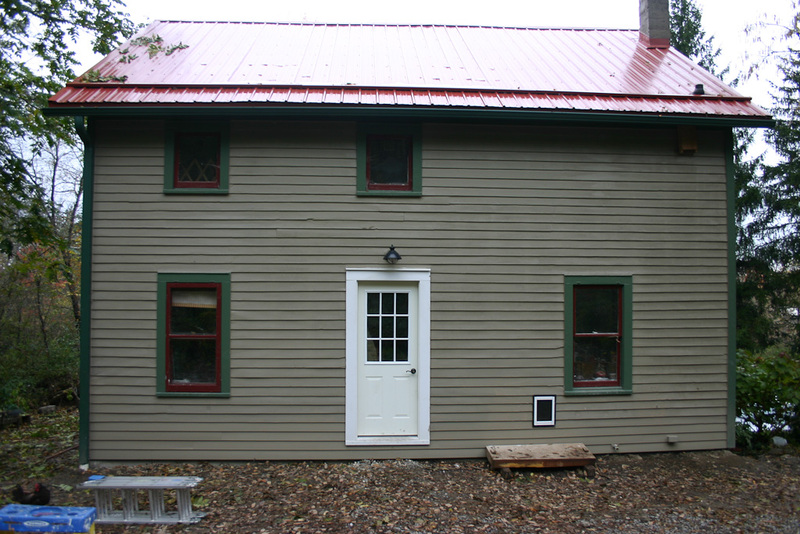 So far, I've managed to do all the siding, but the cold weather and the election have made it hard to get to painting the door trim green and the door itself red. About a week after this, the excavator came and put the soil back in place against the concrete. This finished the project for the contractor, and it was time for the last piece of the bill, which stayed within 10% of the estimate despite the complications on the sill beam. 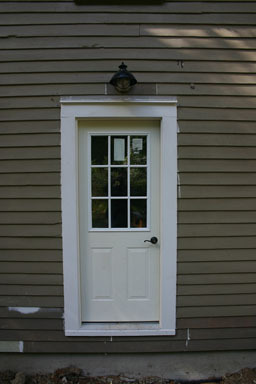 Still need to paint the door and the trim. Too many people think that farming, especially in our rolling terrain, is a dying way of life. It's been a lousy year for milk prices, there's a "rural brain drain" going on, and farming seems stuck in a brutal cycle in which the actual farmers get an ever-smaller share of the money spent on food. The classic joke about a farmer who wins the lottery asks him what he'll do with the money: "Keep on farming until the money runs out." Nonetheless, I see farming - more broadly, agriculture - as a key part of economic growth for Dryden. It's not just nostalgia, and definitely not the awful thought of preserving green spaces at the cost of those who live there. Dryden's soil isn't perfect - but other factors matter more. To figure out what this means, I'll take a look at different kinds of Dryden agriculture, what their prospects might be for the future, and how I'd like to see the Town encourage them. It's a complex mix, and any useful program for encouraging agriculture will need to reflect that diversity. Cows resting above Town Hall. Five times as much milk was sold in 2007 from dairy farms based in Dryden as was sold in 1917. Labor productivity in terms of milk sold per worker has increased 35 times in the century reflecting the great gains made from advances in agricultural technology. Dairy farm numbers have decreased from 206 in 1907 to 8 in 2007. Dryden's dairy farms continue as an important contributor to the economy of the Town. We have 1/25th the number of dairy farms and a much smaller number of people working on them. While the study is correct that dairy farms make an important contribution, their immediate impact on Dryden residents are much smaller. We have 1/7 as many people working at dairy farms, while the population has tripled from 3590 to 13,500+. That doesn't mean, however, that we should ignore dairy farming or just let it go. Our climate and soils are well-suited for use as pastures, the area has supporting infrastructure for dairy farming, and even though milk prices look terrible now, they don't always stay in the basement. I'm very glad that the Town of Dryden has been supporting applications for Purchase of Development Rights for farms that want them, preserving a lot of our best land while paying farmers for the privilege. One other key possibility, for dairy as well as for other kinds of farming, is to work toward more local processing. I was delighted a few years ago to find delicious Wideawake Farms cheese curds at Dairy Day, and I understand there may be more of that coming in the future. Dairy farmers in particular constantly find themselves at the mercy of processors, who seem to claim larger and larger shares of the money consumers spend on food. This probably wouldn't involve the Town building infrastructure itself, but the Town might find ways to support such projects, helping with grant applications or connecting people with similar needs. 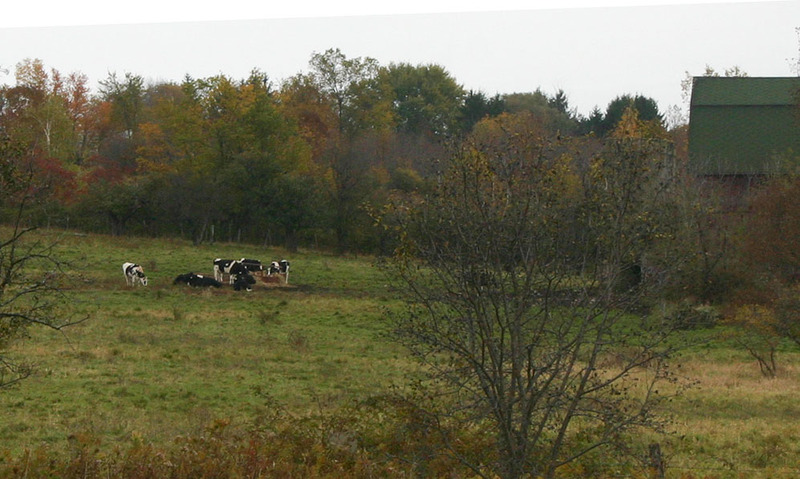 While most of the large farms in Dryden are dairy farms, we have many more small farms. Driving around Dryden, I regularly see beef cattle, goats, sheep, and horses, not to mention beehives, U-pick farms, and orchards. These tend to be smaller operations, and I'm sorry to report that I've heard them derided a few times as "hobby farms" for "weekend warriors", or just plain "too small to be important". Right now I see more potential in small farms growing a limited amount of food than in larger farms producing huge volumes of commodities. For the last few decades, "bigger is better" has been the motto of people striving to make farms more profitable, applying economies of scale wherever possible to increase production while reducing the cost of inputs, especially labor. Small farms, though they can share equipment and facilities, can get only limited economies of scale. Mother and chicks at my house. 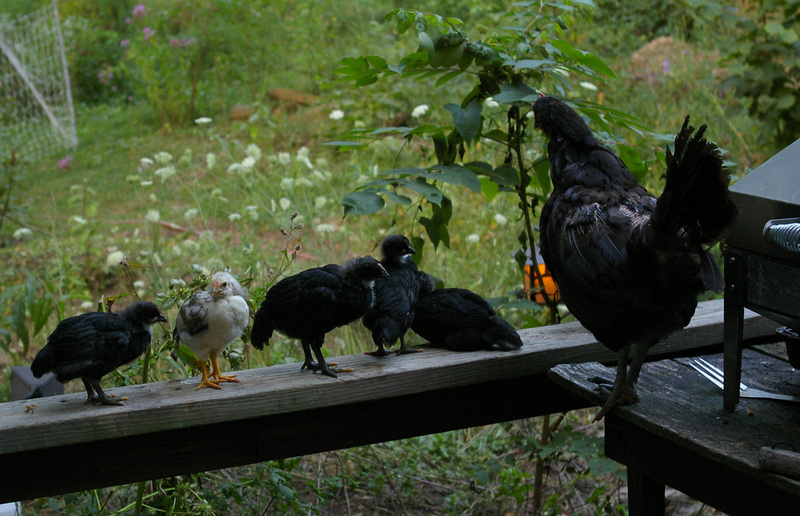 Small farms have other advantages, though, as Americans (and especially Tompkins County residents) take a closer look at where their food comes from and don't always like what they see. "Whatever the grocery store has" isn't a good answer for a lot of people any longer, whether because of quality, environmental, nutritional, or other concerns. The potential for small farms in Dryden isn't just about our soil, which isn't perfect, or our capability for automation, which is limited. The potential for small farms here has much more to do with the growing local market for local goods. We can establish those relationships. If you've looked at Edible Finger Lakes, you might reasonably suspect that it's all about yuppies and wineries, but there's a growing broader market. In many cases (though not for meat, that I've found), fresh local seasonal food costs the same or less as its long-distance grocery store equivalent, and a customer base is noticing. The existence of local markets means that local farmers can sell their produce without having to figure out how to deal with larger grocery stores who are more comfortable working with year-round suppliers. It also creates opportunities for them to differentiate their products beyond the usual categories. Varieties, approaches to production, and kinds of processing all help farmers reach customers looking for new or particular experiences. Many of the crops for our local markets can be grown well in small spaces. You don't need 100 acres to grow lettuce or tomatoes. A market garden could be a fraction of an acre, perhaps even a chunk of an existing large yard. They don't even need or necessarily want a tractor. 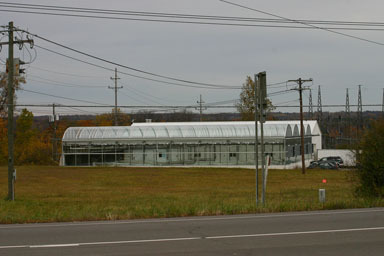 (Some could be greenhouses, even hydroponic greenhouses like Finger Lakes Fresh.) Maintaining small herds of livestock still requires constant effort, but it's certainly possible and can even be lucrative. Figuring out local food processing is going to be a key next step. Direct contact with customers gives farmers much more flexibility in choosing how (and if) to process the food they create. I've been impressed by the steady rentals of the Varna Community Center's commercial kitchen, and might be an example on which to build. One category of processing, slaughterhouses, remains a special challenge, as there aren't huge numbers of them any more and they have a lot of regulatory overhead to deal with. It may not be all about food, either. Dryden certainly has a lot of farms centered on horses for riding. Some of these breed horses, and others provide stables and teaching. These can also bring money to Dryden homes. 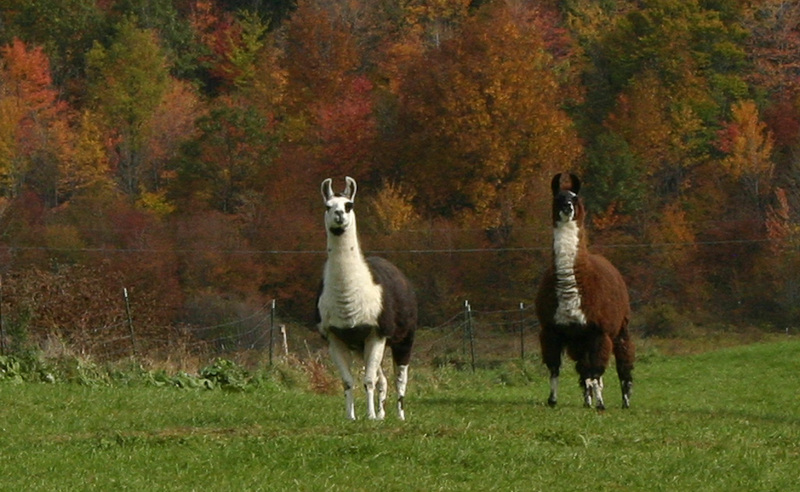 What can the Town of Dryden do to encourage this wide variety of small-scale farms? Some of the possibilities are much like the usual economic development plans. The Individual Development Accounts program the Town set up recently with Alternatives could help people raise the funds needed to get started on a market garden, for example. Other possibilities are more specific to farming. Encouraging Cooperative Extension to make some presentations out in Dryden might expose a lot more people to the possibilities and would cost very little. 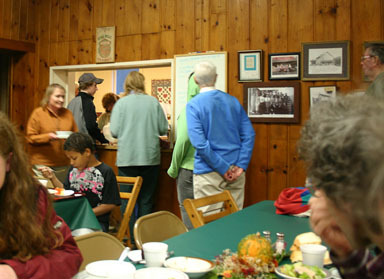 They filled the Dryden Community Center Cafe with a home energy presentation a year or so ago, and I'm sure there are enough people in Dryden who'd be interested in such events to fill a room again. There have been occasional suggestions of setting up farmers markets in Varna or in the villages. We enjoyed blueberries and carrots while attending Music in the Park and Old Home Days, though I don't know how well that worked out as a business. We also have a lot of farmstands in the Town (Dedricks, Fall Creek, Garden of Eatin, BB Farms, Ludgate Farms), which offer more reliable business hours and a steadier selection of food. While I would very much like to see a farmers market somewhere in Dryden, that will likely be a slow and experimental process as we figure what works. 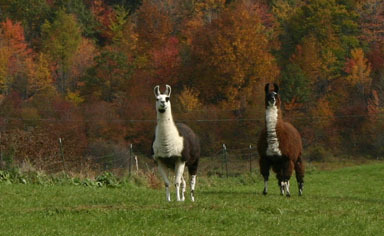 I also wonder if there's more room for Community Supported Agriculture (CSA) in Dryden. I'm not sure the Town can play a role in that specifically, but I'd like to see more of them. Customers pay in advance for weekly deliveries of food over a season, even over the winter. One combination I've liked is the (non-Dryden) Full Plate Collective's offering customers the opportunity to pick up their shares at Ludgate Farms. While the share competes with a lot of things Ludgate Farms sells, I often end up buying more at Ludgate just because the share brought me in there. Finally, on a different note, when I first moved to Dryden there was some discussion of setting up a larger network of horse trails. That's definitely something I'd like to see as a part of the broader conversation about trails. Horses and riders both seem to like long rides. Small farming is not an easy project. Both the farming side and the marketing sides are complex and difficult. Nonetheless, it's becoming a larger and larger opportunity, one that seems to me to fit Dryden well. They aren't exactly farms, but Dryden seems blessed with an abundance of nurseries and greenhouses. 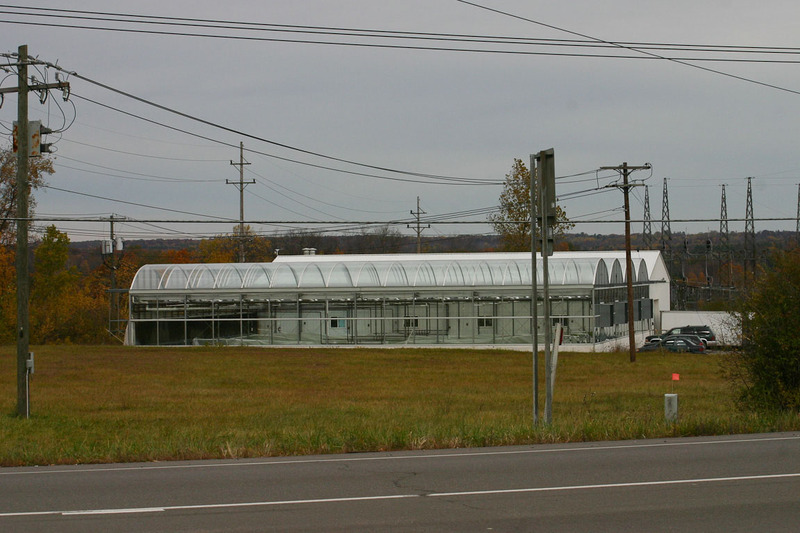 Driving along Dryden Road (Routes 366 and 13), you pass Saunders Greenhouse, The Orchid Place, Finger Lakes Fresh, and RPM Ecosystems. The Plantsmen up on 34B have a unique native plant focus. Besemer Hill Greenhouses uses wood for heat, and A New Leaf on 79 grows orchids and other unusual indoor plants. Finger Lakes Fresh grows hydoponic lettuce and more. It's not clear to me how exactly Dryden wound up with a concentration of nurseries and greenhouses. The Orchid Place emerged from the ruins of the old Boxcar restaurant, and its greenhouse is amazing. Finger Lakes Fresh started out as a Cornell research project with support from NYSEG (PDF), and I think the NYSEG connection is why it's there. 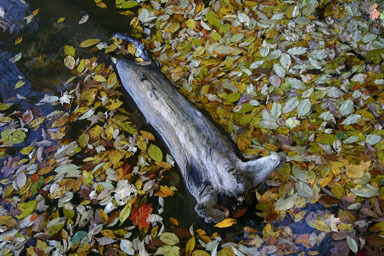 RPM Ecosystems arrived in part because the site met its needs, with abundant water from Virgil Creek. Henry Slater, the Dryden Code Enforcement Officer, apparently helped them find us, and the county also supported the venture. I'm not sure what the Town could do to help its nurseries beyond general economic development work, but at the very least this is a story we should tell more often. My next-door neighbor's house, at 1251 Dryden Road (2007 photo). This seems to be the listing, with more current photos. 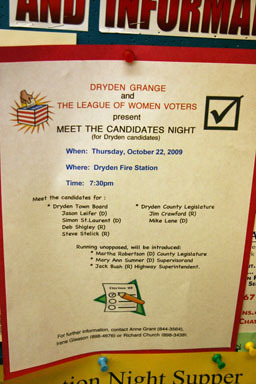 Last night's Dryden Candidates forum, hosted by the Dryden Grange, moderated by the League of Women Voters, and held at the Dryden Fire Station, went pretty smoothly. It feels strange for me to comment on it as I was pretty nervous at the front table, but there weren't many explosions of controversy. Current County Legislator Mike Hattery (R), and Jim Crawford (R), who's running to replace him seemed pretty determined to take on Mike Lane (D), but I didn't think it went over that well. 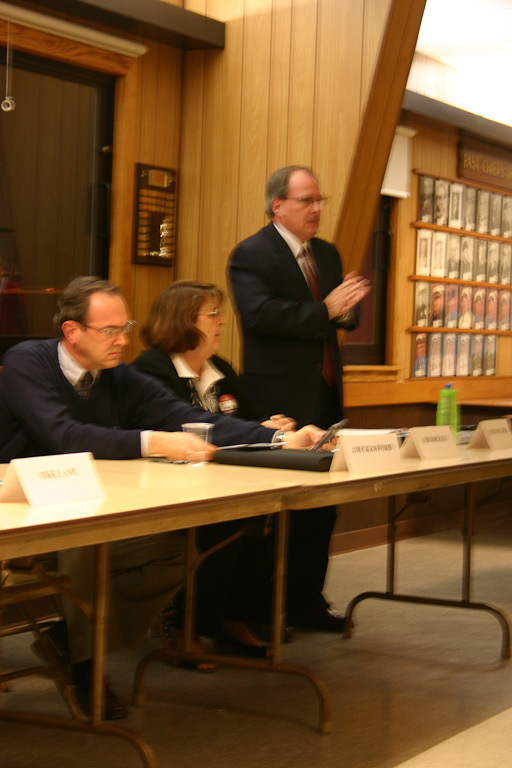 There was less disagreement among the Town Board candidates than I'd expected. Thanks to Kathy Zahler and Mary Ann Sumner, I have a few pictures. It was fairly dark and these photos were taken without a flash, so they're not exactly crisp, but they can give you the flavor of the event. 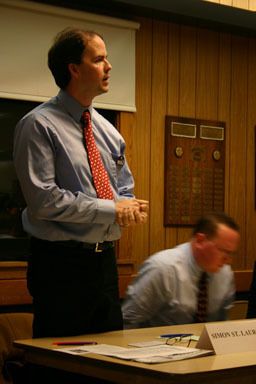 Steve Stelick (R), running for Town Board. Deb Shigley (R), running for Town Board. Jim Crawford (R), running for County Legislature, District 14. Mike Lane (D), running for County Legislature, District 14. Jason Leifer (D), running for Town Board. Simon St.Laurent (D), running for Town Board. By coincidence, the Ithaca Journal chose today to run its article on Dryden Town Board candidates. It's brief, but I think it at least gets the ideas across I've heard each candidate share. Tuesday, October 27, 7:00-9:00 p.m. This FREE public meeting will introduce residents to the issues associated with the development of natural gas production in the Marcellus Shale. The program will provide an overview of the relevant geology, water issues related to drilling and hydrofracking and the potential economic benefits and community impacts. For more information, contact: Cornell Cooperative Extension of Tompkins County at (607) 272-2292 or email ska2@cornell.edu. This FREE public forum will include presentations by legal experts on the terminology and issues surrounding natural gas leases, followed by an opportunity to ask questions. Topics covered will include general lease terminology, "force majeure" lease extensions, compulsory integration (the legal extraction of gas from under unleased land), liability issues, and the protection of rights and property. Additional details will be available at http://gasleasing.cce.cornell.edu. The forum is presented by Cornell Cooperative Extension South Central NY Agriculture Team, with Shaleshock Citizens Action Coalition, the Community Science Institute, Finger Lakes Bioneers, Interfaith Action for Healing Earth, NYS Assemblywoman Barbara Lifton, Sustainable Tompkins, and the Tompkins County Farm Bureau. For more information, contact CCE-Schuyler at (607) 535-7161 or email cab377@cornell.edu, or call CCE-Tompkins at (607) 272-2292. Topics include the Geology of the Shale; Municipalities and the Marcellus Shale; Environmental, Water and Regulatory Issues; Local Government Preparation; Workforce Development and Small Business Application; Landowner management; Legal Issues; Water and Wells; Community Development; Taxation, Revenues, and Property Valuation; State and National Energy Plans. Local government officials, landowner coalition representatives, citizens seeking more information, industry representatives, environmental advocates, and researchers and educators are encouraged to attend. FEE: $40. Suggested donation for van pooling: $5. Visit gasleasing.cce.cornell.edu for a link to detailed information and to register for the summit . To register for van pooling from Tompkins County Cooperative Extension, contact Sharon Anderson at (607)-272-2292 or ska2@cornell.edu. None of these are in Dryden, but it's clearer and clearer that these questions are high on Dryden residents' priority list! Tompkins County Health Department received a new supply of seasonal flu vaccine. They have scheduled a vaccination clinic for next Wed. (Oct 28) 1-3 pm at the Varna Community Center. This is for seasonal flu only (not H1N1, swine flu). Medicaid and Medicare will be accepted, otherwise the cost is $35. You'll need an appointment: call the Health Department at 274-6616. Code Enforcement Officer Henry Slater used to remind the Planning Board about another category of farmer: tree farmers. There are Christmas tree farms, but also a lot of logging operations. 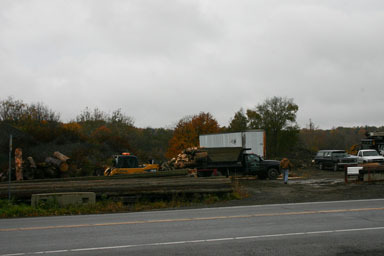 Some of the logging is for firewood, some for lumber, some for pulp, and some just to clear the land for development. Our forests may get more interesting in the next few years as wood heat is a big story again. Classic woodstoves are part of that, but so are wood pellet stoves (and possibly grass pellet stoves eventually) and larger heating systems that run on chipped wood, often material that has to be thinned out of forests anyway. These larger systems are generally for bigger buildings, complexes, or even neighborhoods, but aren't yet common in the United States. 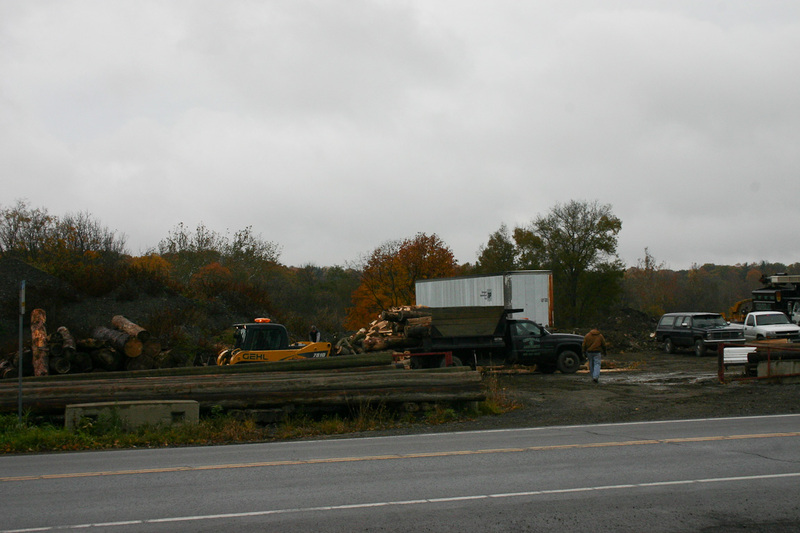 Cayuga Nature Center, across the lake, is installing one as part of a pilot program. Lumber, of course, is still important, though many of our trees are too young or not the right species. For those lucky enough to have the right hardwoods, they can be valuable. A friend of mine hopes that some trees on her property will help pay her child's college tuition. There are other possibilities as well, like maple sap harvesting for syrup. 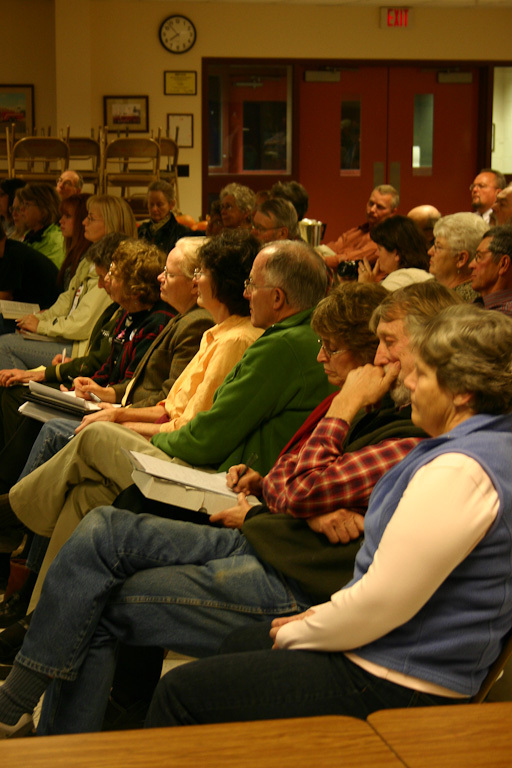 What can the Town do to encourage forestry? The most common complaint I hear from owners of forest is the burden of property taxes on land that only produces a return occasionally. I'm not sure there's an easy way for the Town (which accounts for a tiny proportion of those) to help with that, though county assessment policies seem to be a factor. The Town might be able to encourage use of biomass heating, creating a local market for the waste wood, if the pilot projects are promising. The approaches outlined in the upcoming zoning law might make it easier to create neighborhood structures where district heating could work using these larger biomass systems. Less directly, the Town's stewardship of the Cortland Road Sewer District and a possible Cortland Road Water District can also affect Dryden school taxes, as the Dryden High School / Middle School is in that area. There's likely not that much the Town can do - and it's a tiny chunk of the school district budget - but we should certainly do everything we can to keep those costs low. I'm not yet sure how much of the Town they visited, but Google Maps seems to have added street views of a variety of places. The street views are pretty far out of sync with the satellite views, though - the street views are definitely newer. For example, you can see my house from above, and zoom down into it using the plus sign on the left just below the yellow person. It's an old photo, as I said farewell to the car parked there in January 2008, and there's an additional shed now. If you then click on the little yellow person, you can drag it to the marker for my house. (Oddly, though, it sometimes claims "no street view available" before showing the street view.) Once you've brought up street view, you can (sort of) navigate along the road. It's no substitute for actually walking around the town, but it's a different way to see things, and can help with navigation sometimes. I've been annoyed that the Ithaca Journal web site seems to have descended into a chaotic and sometimes repetitive mix of news from the Ithaca, Elmira, and Binghamton papers. Every once in a while, though, it's helpful for finding news about issues that affect the region broadly. Since gas well drilling is much busier to our south, seeing that news makes it easier to know what we might want to be coming here. "Where will the funding come from to adequately implement a program locally to review and monitor water data at private wells within 1,000 to 2,000 feet of a drilling rig before, during and up to a year after drilling has begun?" he said in a news release. "It is certain that more county health department staff will be needed to engage in this process and ready this important public health service in Chemung." I've heard the same concern in Tompkins County as well. It seems like another step toward making the counties a branch of state government, providing services to Albany without getting the responsibility and choice of actually being in control of their territory. It's not a new trend, but seems to be yet another unfortunate side effect of the push to drill. 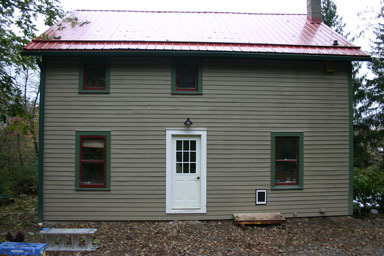 The Saltonstall Foundation for the Arts, located on Ellis Hollow Creek Road, is now taking applications for artists and writers who'd like to spend a month there in 2010. They have openings for poets, fiction writers, photographers, painters, sculptors, and visual artists. It's a beautiful place, and the residency includes a month of quiet in an apartment with a studio and meals provided. Applicants must be from New York State, and the deadline is January 15, 2010. 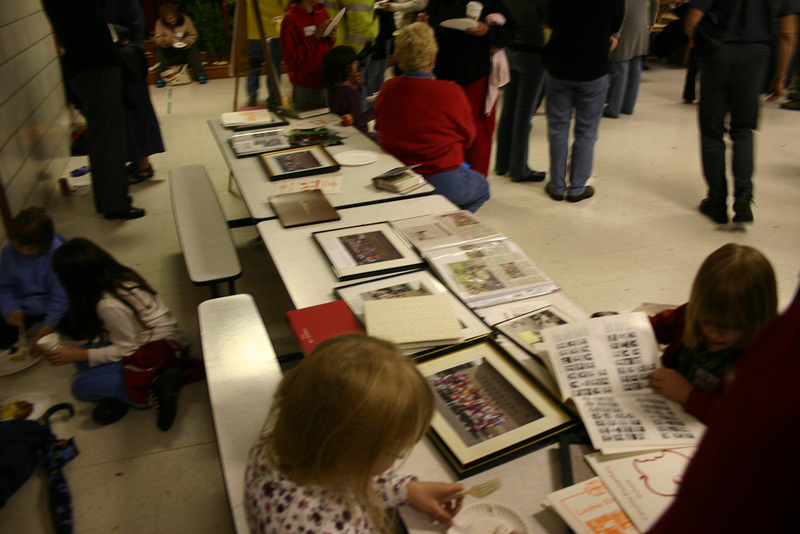 I wrote about an open house they had in 2005, if you'd like more information on what it looks like.